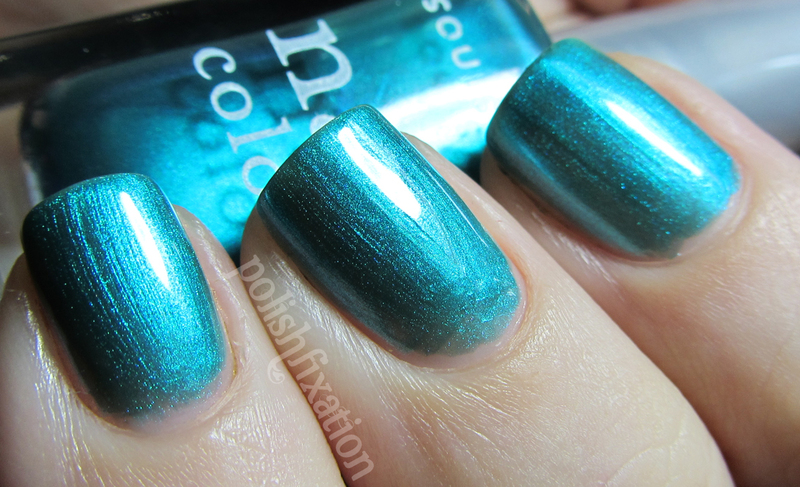 polish fixation: New from Soulstice! Hi everyone! Hope your first week of October was great and that you had a wonderful weekend! Today I have a few more polishes from Soulstice to share! The new colours I have to show you today are called St. Barts and Nevis. St. Barts is a frosty/shimmery teal that glides on smoothly and is opaque in just two coats. I thought this was going to be more sheer than it turned out to be, which was a great surprise! I think this color looks great against my skin tone, and is really versatile and fun! Nevis is a "bright & Happy green". I absolutely adore shades like this, especially in creme form! It was opaque in just two coats. The first coat was a little bit streaky but after the second coat it was perfect! Love it! I have always been impressed with the offerings from Soulstice and if you haven't tried out their polishes already, I would highly suggest you check them out! St. Barts... Droooool!!! Even the brushstrokes don't bother me... It's GORGEOUS!!! I love Nevis!! It's so pretty against your skin!! I'm in love with St. Barts!!! I like Nevis. 2 flashy colors!